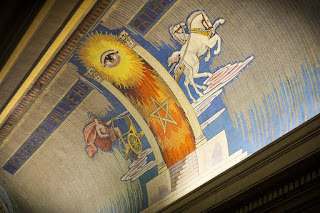 An article on the Vice website today briefly visits and has a superficial chat with brethren at Freemason's Hall in London. We're at the United Grand Lodge of England (UGLE) in London's Covent Garden, the imposing stone building decorated with esoteric symbols. The Masons' reputation for mysticism has made them a beacon for conspiracy theorists, ranging from purported links with 9/11 to the Illuminati and New World Order. Now, in the lead up to their tercentenary, the Masons are trying to manage this centuries-old PR problem. The question is, what happens when the world's oldest secret society tries to open its doors? Part of the Masons' makeover is challenging the most persistent myths. "We actually prohibit politics and religion in what we do," Mike tells me. They're even hesitant about making public statements, "because of our history and because we would not want to seem politically motivated. You know, the conspiracy theories around, with Bilderberg and things like that." So why join if there's no opportunity to meddle in politics? It's all about the values, Mike says. The Masons make charitable donations as part of their community involvement. Right now they're in the middle of funding London's second air ambulance. "The next time you have a serious accident and the air ambulance flies down and, underneath it, you'll see a square and compasses – just think how that happens to be." Part of the problem for the Masons is that their distinctiveness is both a blessing and a curse. They're a deist non-religion marked by a disjointed mixture of conservatism and high theatre. Surely some of the attraction for any potential member is that weirdness. After all, what's the point of joining a secret society that wants to be open, transparent, and normal? But with that comes more of the same reputational hammering the Masons want to avoid. I ask Mike if there's ever the temptation to just open everything up? Almost all of their material, he tells me, is available online anyway. However, for UGLE's members, looking would spoil the surprise. Right now they're trying "to demystify it but without removing the element of fascination – that's the difficult thing." If the Masons want to celebrate their fourth centenary, they'll need to square that difficult circle. The author points out a sad observation, "Talking to the press officer, it's clear that part of their strategy is downplaying anything too weird." 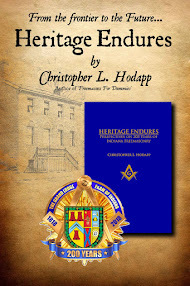 Part of the enjoyment and enlightenment we receive as Masons, in the Blue Lodge and in all of the myriad appendant bodies we are able to join upon becoming Master Masons is the search for more knowledge, and much of that is accomplished by activities that many profanes regard as being "too weird." It is also partially the allure that draws men to join in the first place. But if we keep going to the press and hawking our charities, while saying over and over, "Nothing to see here. No wacky stuff going on, just some old boring ritual things you wouldn't really understand, along with these apron thingies. And let me mention all the money we gave to a big program last week," we are in very real danger of destroying the very image that draws men to join in the first place. We CAN speak to the press and the public about what we do without dismantling the allure of the fraternity, by providing the back story of our real and mythical origins - the why of what we do. Tell a reporter why you joined, what makes you come back every Tuesday night, what it has meant to you, instead of trying to deny that we are up to anything peculiar. Sadly, the UGLE has been doing this for years, and even though I certainly understand that they deal with far more anti-Masonic distrust culturally than we do in the US, I fear they go too far with the "openness" policy. By contrast, the French have a far worse time of it than their English Brethren do with the anti-Masonic press. Any time there's a slow news month, French magazines trot out another big, exciting headline accusing Masons of controlling their government or banking. The three major grand lodges there, as a rule, don't bother to answer such allegations publicly. In the few interviews they agree to, they are very sacrosanct. And yet, Masonry there continues to grow slowly, and not plummet the way US and English Freemasonry does. I think it may be time to rethink the strategy. Great Post and thoughtful comment, Chris. Doesn't that cut the heart right out of the very essence of the Craft? Secrecy. like so much in Freemasonry, is a symbol, of our honor. See HERE FOR THAT STORY. Secrecy is absolutely essential to our Craft. After studying the "Element Encyclopedia of Secret Societies" by Arch Druid (Masonic Brother, Sir Winston Churchill, was also a Druid) and Masonic Brother, John Michael Greer, I found there are several dozen esoteric and initiatic Orders outside of Freemasonry operating today which are enjoying a great deal of Secrecy. The public does not seem to care much about them or their activities. If these other Orders can have their Secrecy and Privacy, why not us Masons? Are we not Worthy of such respect? Of course we are! If we donot demand it, the world will lose respect for us. Religiously and Politically motivated Critics of Freemasonry are a dime a dozen. They are often nefarious and insidious. Not very nice at all. Masonic leaders and members must learn not to be afraid of such Critics. Critics will always be around as long as men like them have shortcomings and inferiority complexes which cause them to try and find faults in others. Masonic education is the key to dealing with any type of Masonic Critic. 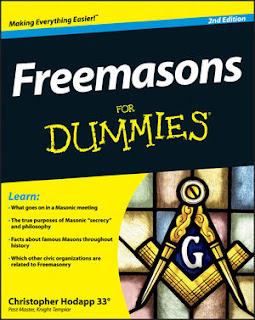 Some people have sincere sensibilities and are simply naive or ignorant of Freemasonry and can be reached by the excellent books written by WBro. Chris and others. But not the truly Nefarious Men. They are of a different breeding. Many of them have read the books and seen some rituals. They know Freemasonry is about Morality and they hate us for it. They want us to stray from the path and become Ruffians for them to save (control). To them, the truly Nefarious, who may be reading this comment, I make no apologies.